This article is about bandit corpses. For living bandits, see Bandit. For other uses, see Bandit (disambiguation). 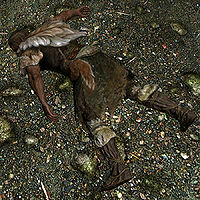 These bandits are deceased NPCs found in a variety of locations in Skyrim, particularly in caves and in the wilderness. Their races and inventories will vary, but all are dead and are found in fixed locations. These bandits are all female Breton wizards. They wear fur armor while their footwear is randomly determined. There is always a 50% chance of a pair of fur shoes and a 50% chance of leveled footwear; from level 1-5 they can be hide boots, from level 6-18 they can be leather boots, and from level 19 it can be scaled boots. They carry a random staff, an iron dagger, some random loot, some gold, and either a potion of health or magicka. 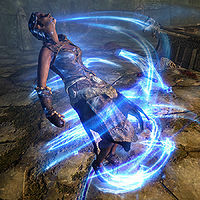 Despite their condition, they also know a variety of spells, specifically Lesser Ward, Healing, Oakflesh, magicka recovery, and three Destruction spells, specifically Flames, Frostbite, and Sparks. In Ilinalta's Deluge, in the final room in front of Malyn Varen's skeletal corpse. In the second chamber of Shimmermist Cave, alongside two other dead bandits in a small alcove. 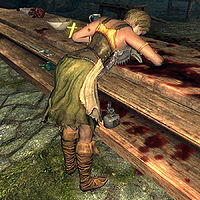 ^¹Must not have completed either the Imperials or Stormcloaks related civil war quests. ^²You can only access this location by initiating the related quest. These bandits are all male Breton bandit wizards. They wear fur armor while their footwear is randomly determined. There is always a 50% chance of a pair of fur shoes and a 50% chance of leveled footwear; from level 1-5 it can be hide boots, from level 6-18 it can be leather boots, and from level 19 it can be scaled boots. They carry two potions, an iron dagger, and have a 25% chance of carrying a lockpick and a bit of gold. Despite their condition they also know a variety of spells, specifically Lesser Ward, Healing, Oakflesh, magicka recovery, and three Destruction spells, specifically Flames, Frostbite, and Sparks. In Sightless Pit, at the bottom of the first pit north of the bandit camp. In Greywater Grotto, southwestern corner of the first chamber, near a small waterfall. In Gloomreach Cavern, inside a cage in the central chamber. 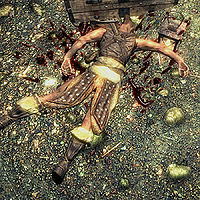 In Kagrenzel, within the first main chamber, alongside another dead bandit. 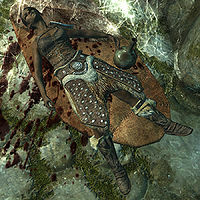 In Forelhost Crypt among several other dead draugr, located just after a pendulum trap. In a small room in Darkshade, off the eastern wall of the second chamber. In the main chamber of Lost Knife Hideout, located next to the ramp going towards the stream. ^*You can only access this location by initiating the related quest. These bandits are all female Dunmer bandit wizards. They wear fur armor with randomly determined footwear. There is always a 50% chance it will be a pair of fur shoes and a 50% chance of leveled footwear; from level 1-5 it can be hide boots, from level 6-18 it can be leather boots, and from level 19 it can be scaled boots. They carry an iron dagger, one or two leveled potions, and a bit of gold. Liar's Retreat inside fenced prisoner area. ^¹You can only access this location by initiating the related quest. These bandits are all male Dunmer bandit wizards. They wear fur armor with randomly determined footwear. There is always a 50% chance it will be a pair of fur shoes and a 50% chance of leveled footwear; from level 1-5 it can be hide boots, from level 6-18 it can be leather boots, and from level 19 it can be scaled boots. They carry an iron dagger, a random staff, one or two potions, and a slim chance of some random loot such as lockpicks, food, and jewelry. In Sightless Pit, on a ledge, just north of the bandit camp. One can be found on a table within the first chamber of Silverdrift Lair. One can be found within Volskygge Passages, at the bottom of a spike pit situated underneath a trap door. In Darklight Chambers, situated between a spike pit trap in the center of first chamber. ^*You can only access this location during the related quest. These bandits are all female Imperial bandits. They wear a randomly determined set of light armor; at all levels, there is always a 50% chance they will wear fur shoes and a set of fur armor, while the other 50% can differ for both shoes and armor; at level 1-5 it can be hide boots and/or hide armor, at level 6-18, it can be leather boots and/or leather armor, and at level 19-28 it can be scaled boots and/or scaled armor or scaled horn armor. Additionally, they have a 50% chance of wearing a set of leveled gauntlets, again randomly determined; it can always be fur bracers but, at level 1-5, there is a 50% chance it can be hide bracers, at level 6-18 it can be leather bracers, and at level 19 it can be scaled bracers. Lastly, there is a 20% chance of them carrying a leveled shield, up to elven quality at level 12. 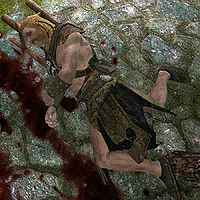 The carry an amount of gold and either a mace, a sword, or a war axe, all of them leveled to elven quality at level 22. 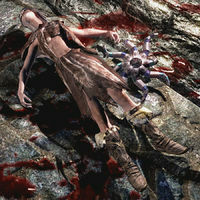 Additionally, they will carry three potions and some random loot such as lockpicks and gems. Slightly past the campsite in Tolvald's Cave, near several bear traps. These bandits are all male Imperial bandits. 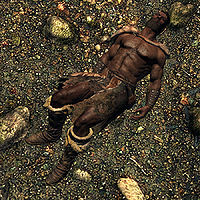 They wear leveled heavy armor; up to level 6 they will wear iron armor or banded iron armor, and iron boots. Up to level 18 they wear steel armor, and steel cuffed boots or steel shin boots. From level 18 onward, they wear steel plate armor and steel plate boots. Additionally, there is a 50% chance they will wear gauntlets and/or a helmet, also leveled; up to level 6 they can be iron gauntlets and/or an iron helmet. Up to level 18, there are two variations of each item, specifically steel Nordic gauntlets or steel imperial gauntlets for the hands, and a steel helmet or a steel horned helmet. From level 18 onward, they can wear steel plate gauntlets and/or a steel plate helmet. Their weapon is random and leveled as well (up to elven quality at level 22) and can be either a mace, a sword, or a war axe. They always carry three health potions and some random loot. They also have a slim chance of carrying a lockpick and/or some gold. Snapleg Cave, just before a chest in the same chamber as a giant frostbite spider. Within the third chamber of Haemar's Cavern, just before the ramp leading further down into Haemar's Shame and next to another dead bandit. Duskglow Crevice, in front of a small fire with a leveled Falmer nearby. Upstairs portion of Duskglow Crevice where the cave becomes more of a Nordic ruin. Within the second corridor, past the first chamber upon entering Volskygge. In Silverdrift Lair, on the upper level, east of the huge central chamber. To the right upon entering the Ustengrav ruins. This bandit is also a male Imperial bandit, with the same statistics and inventory as the other Imperials, but with a different ID. He can be found inside of a cage hanging overhead in White River Watch. These bandits are all female Nord bandits. They wear a randomly determined set of light armor; at all levels, there is always a 50% chance they will wear fur shoes and a set of fur armor, while the other 50% can differ for both shoes and armor; at level 1-5 it can be hide boots and/or studded armor, at level 6-18, it can be leather boots and/or leather armor, and at level 19-28 it can be scaled boots and/or scaled armor or scaled horn armor. Additionally, they have a 50% chance of wearing a set of leveled gauntlets, again randomly determined; it can always be fur bracers but, at level 1-5 there is a 50% chance it can be hide bracers, at level 6-18 it can be leather bracers, and at level 19, it can be scaled bracers. Lastly, there is a 20% chance of them carrying a leveled shield, up to elven quality at level 12. Their weapon is random and leveled as well (up to elven quality at level 22) and can be either a mace, a sword, or a war axe. They always carry three potions, some random loot, and a bit of gold. One inside Fort Snowhawk Prison, in a cage. In a cart situated within a corridor of Northwatch Keep. Within the third chamber of Haemar's Cavern, just before the ramp leading further down into Haemar's Shame. In Bleakcoast Cave, in a room off the western wall of the main chamber, near a frost troll and the dead body of a novice conjurer. In Silverdrift Lair, the first huge chamber, near the copy of the Two-handed skill book Words and Philosophy. In Volskygge Passages, directly below a lever opening a secret passage nearby. In Greywater Grotto, at the base of the first huge waterfall. On top of a barrel near the open pit fire in Graywinter Watch. These bandits are all male Nord bandits. They wear randomly determined light armor; at all levels, there is a 50% chance it will be fur shoes and a set of fur armor, while the other 50% can differ; at level 1-5 it can be hide boots and/or hide armor, at level 6-18 it can be leather boots and/or leather armor, and at level 19-28 it can be scaled boots and/or scaled armor or scaled horn armor. Additionally,they have a 50% chance of wearing a set of leveled gauntlets, again randomly determined; it can always be fur bracers but, at level 1-5 there is a 50% chance it can be hide bracers, at level 6-18 it can be leather bracers, and at level 19 it can be scaled bracers. Lastly, there is a 20% chance of them carrying a leveled shield, up to elven quality at level 12. Their weapon of choice is random and leveled as well (up to elven quality at level 22) and can be either a mace, a sword, or a war axe. They also carry a bit of random loot, food and drink, with a slim chance of a lockpick and/or some gold. One inside Fort Snowhawk Prison, in a cell. Another inside Fort Snowhawk Prison, in the secret passageway. In the first chamber of Silverdrift Lair, on the floor. In Silverdrift Lair, in front of the word wall. Liar's Retreat in the center of the dining area. In Ustengrav, right after entering. In Ustengrav, in the eastern part of the first chamber. In Druadach Redoubt, in the southeastern corner, near an open cage. In the central chamber of Cold Rock Pass. On top of a rock near an open fire pit in Graywinter Watch. Just past the first cages in Ravenscar Hollow, near another dead bandit and a dead spriggan. Within a adept-locked cage in Ravenscar Hollow, near two hagravens. In the center of the wolf arena in the Bloodlet Throne, along with two other dead bandits. 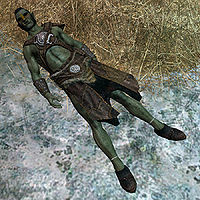 In Bleak Falls Barrow, in the first chamber, near a dead skeever. In Bleak Falls Barrow, on the steps leading to a sarcophagus, near the first bandit camp. In Darkshade, in the northwestern corner of the huge northern chamber. In the main chamber of Lost Knife Hideout, located within the stream. Four can be found within Rannveig's Fast; three can be found within a partially submerged cage, another can be found inside of a cage alongside a steel battleaxe, while the last can be found in a room in the upper portion of the ruin itself. ^¹These bodies are only enabled during the related quest. These bandits are all male Orc bandits. They wear a randomly determined set of light armor; at all levels, there is always a 50% chance they will wear a pair of fur shoes and a set of fur armor, while the other 50% can differ for both shoes and armor; at level 1-5 it can be hide boots and/or hide armor, at level 6-18 it can be leather boots and/or leather armor, and at level 19-28 it can be scaled boots and/or scaled armor or scaled horn armor. They also carry a leveled light shield, up to elven quality at level 15 and have a 50% chance of wearing a set of leveled bracers, again randomly determined; it can always be fur bracers but, at level 1-5 there is a 50% chance it can be hide bracers, at level 6-18 it can be leather bracers, and at level 19 it can be scaled bracers. Their weapon is random and leveled as well (up to elven quality at level 22) and can be either a mace, a sword, or a war axe. They carry a bit of random loot, food and drink, and some gold. One can be found inside Fort Snowhawk Prison, on a bloodstained table. One can be found inside of Mzinchaleft Depths, within a Falmer tent. In a small room within Lost Echo Cave, alongside a dead Imperial. Three can be found inside Silverdrift Lair; one in the first huge chamber, near a bonfire, the second can be found southeast of the huge chamber, on a bedroll, and the third can be found in front of the word wall. At the very bottom of Fort Sungard Oubliette, near the Pickpocket skill book, Guide to Better Thieving. In the center of the wolf arena in Bloodlet Throne, alongside two other dead bandits. Within the first chamber of Bonechill Passage, down near the mammoth skull. 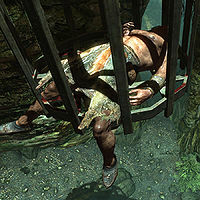 Two can be found inside of Rannveig's Fast; one is at the bottom of a pit along with several other dead bandits, while the other can be found locked inside of a cage. Within a small dead-end passageway overrun with spiderwebs in Fallowstone Cave. These bandits are all female Redguard bandits. These bandits are all male Redguard bandits. They wear randomly determined light armor; at all levels, there is a 50% chance it will be fur shoes and a set of fur armor, while the other 50% can differ; at level 1-5 it can be hide boots and/or hide armor, at level 6-18 it can be leather boots and/or leather armor, and at level 19-28 it can be scaled boots and/or scaled armor or scaled horn armor. Additionally, they have a 50% chance of wearing a set of leveled gauntlets, again randomly determined; it can always be fur bracers but, at level 1-5 there is a 50% chance it can be hide bracers, at level 6-18 it can be leather bracers, and at level 19 it can be scaled bracers. Lastly, there is a 20% chance of them carrying a leveled shield, up to elven quality at level 12. In the final chamber of Haemar's Shame, near the shrine dedicated to Clavicus Vile and with several vampires nearby. In Silverdrift Lair, in the tunnel east of the first chamber. 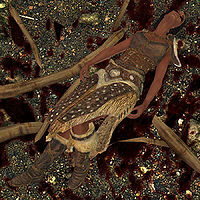 In the main chamber of Lost Knife Hideout, located nearby another dead bandit. 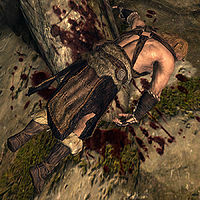 ^*Must not have completed either the Imperials or Stormcloaks related civil war quests. These bandits are all female Bosmer bandit archers. 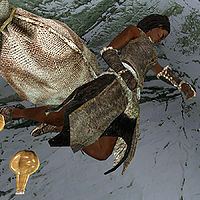 They wear randomly determined light armor; at all levels, there is a 50% chance it will be fur shoes and a set of fur armor, while the other 50% can differ; at level 1-5 it can be hide boots and/or hide armor, at level 6-18 it can be leather boots and/or leather armor, and at level 19-28 it can be scaled boots and/or scaled armor or scaled horn armor. Additionally,they have a 50% chance of wearing a set of leveled gauntlets, again randomly determined; it can always be fur bracers but, at level 1-5 there is a 50% chance it can be hide bracers, at level 6-18 it can be leather bracers, and at level 19 onward, it can be scaled bracers. 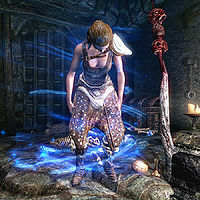 They carry a leveled bow; from level 1-3 it will be either a long bow or a hunting bow, from level 4, it will be an Imperial bow, from level 10 it will be an Orcish bow, from level 15 it will be a Dwarven bow, and from level 20 onward, it will be an elven bow. The twenty arrows are leveled as well and follow the leveling of the bows. Additionally, they will carry six arrows of the highest possible quality and a dagger leveled to elven quality at level 20. They also carry a bit of random loot and some gold. In Hag Rock Redoubt, inside a locked cell. In Silverdrift Lair, on a bedroll, in the room with the Pickpocket skill book Thief. In Broken Fang Cave, in the last chamber. These bandits are all male Bosmer bandit archers. One can be found within Honeystrand Cave, located in the center of the cave itself and with several leveled bears nearby. One can be found within Liar's Retreat, located behind a turned over table in the dining area. One can be found within Duskglow Crevice, located within the third chamber and with a leveled chaurus nearby. 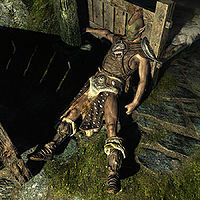 This bandit is a female Imperial bandit who can be found within Shriekwind Bastion on top of a ceiling spike trap, which can be activated by pulling a nearby pull chain. This bandit can also be reanimated by a nearby vampire. 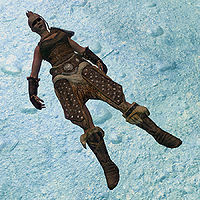 She wears a randomly determined set of light armor; at all levels, there is always a 50% chance she will wear fur shoes and a set of fur armor, while the other 50% can differ for both shoes and armor; at level 1-5 it can be hide boots and/or studded armor, at level 6-18 it can be leather boots and/or leather armor, and at level 19-28 it can be scaled boots and/or scaled armor or scaled horn armor. Additionally, she has a 50% chance of wearing a set of leveled gauntlets, again randomly determined; it can always be fur bracers but, at level 1-5 there is a 50% chance it can be hide bracers, at level 6-18 it can be leather bracers, and at level 19 it can be scaled bracers. Lastly, there is a 20% chance of her carrying a leveled shield, up to elven quality at level 12. Her weapon is random and leveled as well (up to elven quality at level 22) and can be either a mace, a sword, or a war axe. She always carries some random loot and a bit of gold. This bandit is a bandit archer whose race and gender are radiant. She can be found deep within Ilinalta's Deep, usually reanimated by a master necromancer nearby. 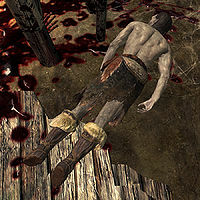 This bandit is a male Nord bandit who can be found in front of the bar in the dining area of Liar's Retreat. He also has a different ID than his regular Nord counterparts. He wears a randomly determined set of light armor; at all levels, there is always a 50% chance he will wear fur shoes and a set of fur armor, while the other 50% can differ for both shoes and armor; at level 1-5 it can be hide boots and/or studded armor, at level 6-18 it can be leather boots and/or leather armor, and at level 19-28 it can be scaled boots and/or scaled armor or scaled horn armor. Additionally, he has a 50% chance of wearing a set of leveled gauntlets, again randomly determined; it can always be fur bracers but, at level 1-5 there is a 50% chance it can be hide bracers, at level 6-18 it can be leather bracers, and at level 19 it can be scaled bracers. Lastly, there is a 20% chance of him carrying a leveled shield, up to elven quality at level 12. His weapon is random and leveled as well (up to elven quality at level 22) and can be either a mace, a sword, or a war axe. He always carries some random loot and a bit of gold. These bandits are both male Orc bandits. They have different IDs than their regular Orc counterparts. Their weapon of choice is random and leveled as well (up to elven quality at level 22) and can be either a mace, a sword, or a war axe. He also carries a bit of random loot, food and drink, with a slim chance of a lockpick and/or some gold. One can be found within the bandit sanctuary at Pinewatch, located underneath a makeshift bridge overhead in the second chamber. 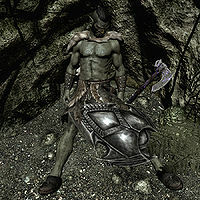 One can be found within Fallowstone Cave, located underneath a small alcove in the second chamber alongside a leveled shield and an enchanted iron war axe. 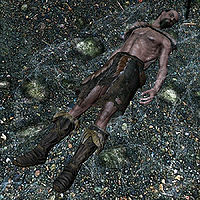 This bandit is a male Bosmer bandit archer found in between two beds in one of the western rooms of Liar's Retreat. He wears randomly determined light armor; at all levels, there is a 50% chance it will be fur shoes and a set of fur armor, while the other 50% can differ; at level 1-5 it can be hide boots and/or hide armor, at level 6-18 it can be leather boots and/or leather armor, and at level 19-28 it can be scaled boots and/or scaled armor or scaled horn armor. Additionally, he has a 50% chance of wearing a set of leveled gauntlets, again randomly determined; it can always be fur bracers but, at level 1-5 there is a 50% chance it can be hide bracers, at level 6-18 it can be leather bracers, and at level 19 onward, it can be scaled bracers. He wields a leveled bow; from level 1-3 it will be either a long bow or a hunting bow, from level 4, it will be an Imperial bow, from level 10 it will be an Orcish bow, from level 15 it will be a Dwarven bow, and from level 20 onward, it will be an elven bow. The twenty arrows are leveled as well and follow the leveling of the bows. Additionally, he will carry six arrows of the highest possible quality and a dagger leveled to elven quality at level 20. He also carries a bit of random loot and some gold. 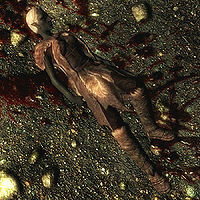 This bandit is a female Breton bandit wizard who can be found dead behind the counter in the dining area of Liar's Retreat. She wears a set of tavern clothes and a pair of boots. She carries an iron dagger, and has a slim chance of carrying a lockpick and/or some gold. Despite her condition, she also knows a few spells, specifically Lesser Ward, Healing, Oakflesh, and the three standard Destruction spells, Flames, Frostbite, and Sparks. This page was last modified on 27 January 2016, at 23:57.